Size/shape: 10mm (from hole to hole) x 12mm (wide) flowers with three petals (the petals just look like three raised ridges around the flower). 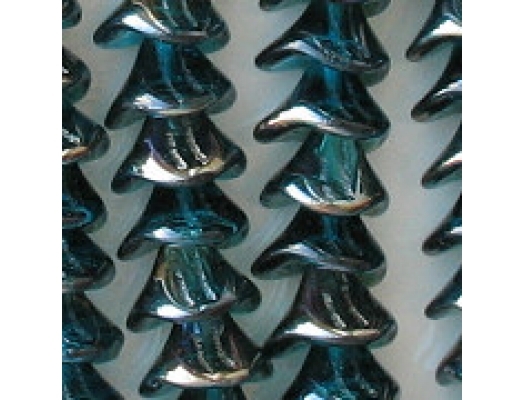 Colors/description: Translucent dark teal or perhaps aqua with a semi-translucent silver-bronze "celsian" coating. The coating is not synthetic. 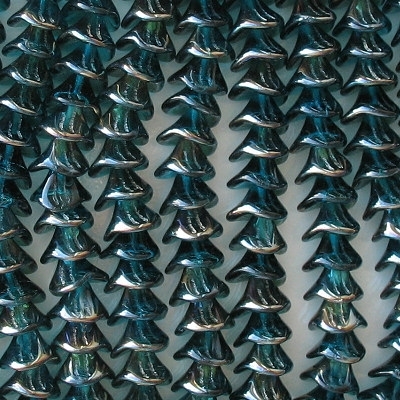 Comments: My picture is old, and it is too dark, meaning that it doesn't show the color of the beads very well (nonetheless, it is larger than the actual beads, so you should be able to see the details). 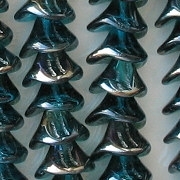 The beads sometimes look teal (greenish-aqua) and sometimes simply aqua. That's because the celsian coating changes the color of the glass when you look through it.